Beginning a step with a protracted glenohumeral joint is but one aspect of the set of behavioral features distinguishing the form of primate quadrupedal locomotion from that of other mammals (Larson, 1998, Larson et al., 2000). Figure 8. 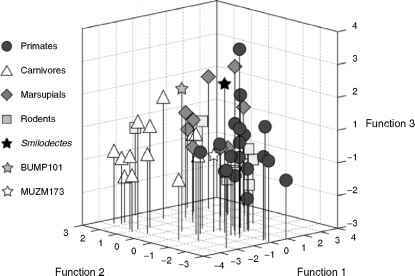 Three dimensional plot of functions 1, 2, and 3 of five variable canonical discriminant analysis. Symbols as in Figures 5 and 7. While Smilodectes falls among rodents for functions 1 and 2, along function 3 it is more similar to some marsupials and primates. Limb protraction has been related to larger total limb excursion (Larson et al., 2000, 2001; Reynolds, 1987), and in turn to relatively long stride lengths in primates (Alexander and Maloiy, 1984; Demes et al., 1990; Reynolds, 1987). Which of these features is cause or effect is less clear. It is also not obvious exactly how they are related to the various other unusual aspects of primate quadrupedal locomotion. Thus attempts to explain how and why any of the features arose in the course of primate evolution at this point are largely speculation (e.g., Larson, 1998). Figure 9. 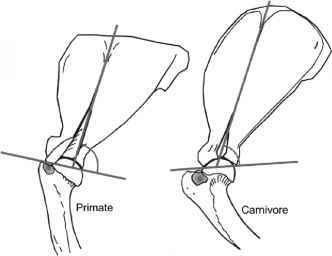 Spinoglenoid angle in a primate and a carnivore. Scapulae have been positioned with parallel scapular spines, and humeri are approximately in a midstance position. A more obtuse spinogleniod angle in primates accommodates articulation with their more protracted humerus. primates. Anthropoids typically have larger spinoglenoid angles than prosimi-ans, but prosimians tend to display more extreme humeral protraction angles (Larson et al., 2000), the reverse of what the results presented here would predict. 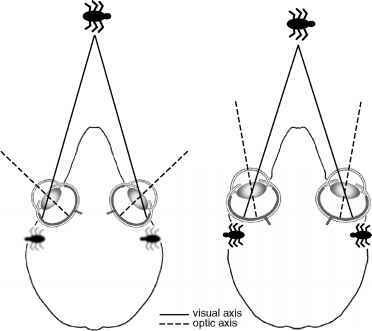 However, comparing the cineradiographic observations on shoulder motion in the brown lemur reported by Schmidt and Fischer (2000) to those on the vervet monkey reported by Whitehead and Larson (1994), prosimians appear to begin a walking step with their scapulae in a slightly more oblique position, and thus even though their spinoglenoid angles are more acute, their glenoid fossae have nearly the same orientation as do those of anthropoids at the beginning of a step. On the primate proximal humerus, the degree to which the greater tubercle projects anteriorly and superiorly has been reduced. Looking at the proximal humerus in side view (Figure 4), it appears that this difference is due to the humeral head being shifted anteriorly so that it encroaches upon the greater tubercle, rather than to the greater tubercle being reduced in size. This places the head more directly in line with the humeral shaft, rather than posterior to it as in other mammals. Therefore, during support phase of a step, the weight of the body passes through the humeral head and along the shaft as the humerus passes from a protracted, to a vertical, and finally to a retracted position. In nonprimate mammals, the humerus begins in a vertical or slightly retracted position and becomes more retracted through a step, and body weight is directed through the more offset head into the humeral neck, which is oblique to the shaft. A possible explanation for the change in humeral head position in primates, therefore, is that it may help to align the humerus and shoulder joint more with the substrate reaction force and thereby reduce joint moments (see Schmitt, 1999). Regarding the three "test" cases included in the study, the BUMP 101 specimen from the Napak CC Miocene locality in Uganda may be a carnivore, but a more extensive comparative study would be necessary to discern its more specific relationships. The MUZM 173 proximal humerus from the Miocene Moroto I locality in Uganda appears to be a primate, and given its age and geographical location, probably of lorisoid affinities. Previous analyses of Miocene lorisoid postcranial material from East Africa have typically indicated either galago-like leaping abilities or general quadrupedalism (e.g., Gebo 1989b; McCrossin, 1992; Walker, 1970, 1974). Although it is not particularly similar to either galago species in the comparative sample, the fact that the MUZM 173 proximal humerus is close to Lemur, Callithrix and Aotus in the discriminant analysis suggests that it may be from a running, leaping form. Finally, while it is well established that Smilodectes is an Eocene primate, judging from the second discriminant analysis without spinoglenoid angle, its proximal humerus appears to be less primate-like than its scapula. In particular, it appears to have a larger bitubercle angle and somewhat more anteriorly projecting greater tubercle than do modern primates. This suggests that this Eocene form may have begun a quadrupedal step with only a modestly protracted humerus. Obviously, to fully investigate when and where the protracted humeral posture characteristic of primate quadrupedal locomotion evolved it will be necessary to examine the morphology of scapulae and proximal humeri of a much larger sample of early primate taxa. It is also the case that the specimens necessary for such an investigation do not all yet exist. Nonetheless, this study suggests that as new material is discovered, we will have the tools needed to recognize and track the evolution of this particular unique aspect of primate quadrupedal locomotion.